Valerie and her Week of Wonders is a coming of age film like no other. This Czechoslovakian film from 1970 is a little know cult classic that was recently restored and released by The Criterion Collection. Its a strange and surreal fairy tale that will keep your eyes glues to the screen for the entire 73 minutes. The film is more of a painting or an experience rather than a traditional narrative story. Rich with metaphor and symbolism its an art house film with a capital A.
Valerie is a young girl of about 13 or so whose transition into womanhood is a scary and dangerous proposition. Her parents are dead and she lives with her grandmother, who may or may not be a vampire or a witch. Valerie is friends with a local boy, Eaglet, whose father may or may not be a vampire or even the devil. He is also known as the polecat, a weasel of a man who is always up to no good. Throw in a sleazy lecherous priest and Valerie must defend her mind and body for what awaits her in adulthood. Her bedroom, however, is a gleaming white sanctuary for which she is free and safe from the outside world. While Valerie's grandmother fears of growing old she makes a deal with the polecat for everlasting youth, Valerie yearns for love, safety, and security. She hopes this will come from Eaglet and a magic pair of pearl earrings. The imagery and cinematography of the film are simply amazing. 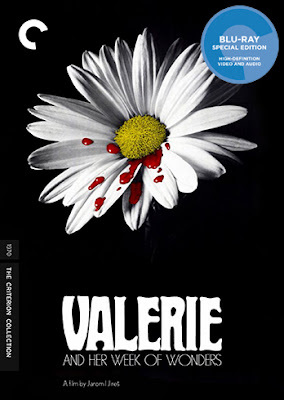 The image of a bloodstained daisy makes for the perfect cover art for the Criterion release. The film takes on many fairy tales but would most resemble "Alice in Wonderland". Its a truly unique vision for this girls very strange week of wonders.